Where there is water,there is life, and Mars was certainly flush with microbial life for the first several hundred millions years after its formation. We know this with certainty, because mineralized, fossilized impressions of Martian microbes have been transported to Earth. Nearly 4 billion years ago, colonies of bacteria were thriving beneath the soil and deep within Martian rocks. When yet another asteroid or comet struck the planet, perhaps 3.6 billion years ago, Martian oceans and streams were likely vaporized or sent splashing across the surface. 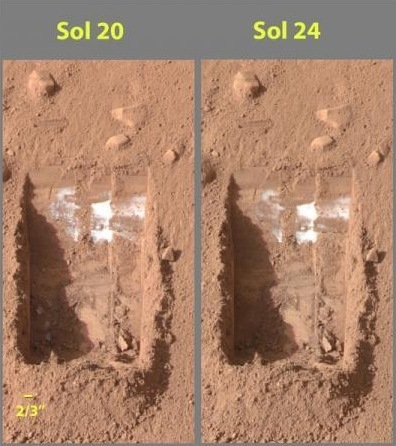 Some of that water, which was highly mineralized, seeped into cracks within Martian rocks washing over and covering living and dead microbes with H2O. Upon evaporating, the dead microbes were preserved and fossilized, and so too were magneto-fossils surrounded by carbonate globules. Nearly 4 billion years would pass, and then, 16 million years ago, an asteroid or comet slammed into Mars with the explosive energy of a million nuclear bombs. The impact blasted chunks of Mars into space, which were ejected at 11,000 mph. One of those rocks was 4 billion years old. Its cargo? 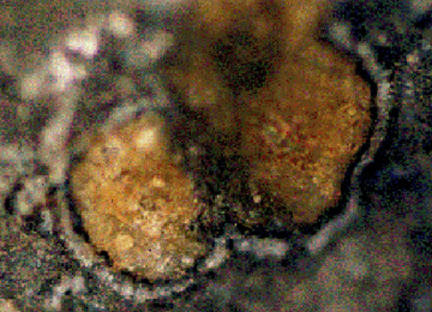 Fossilized Martian microbes. For 16 million years that Martian meteor orbited the sun, and then, 13,000 years ago, it collided with the Earth. The outer portions of the meteor melted from the heat of entry, forming a black glassy crust. Then it crashed near the south pole.There it lay, exposed to the elements and those microbes which thrive in the frozen wastes. And then, one sunny afternoon, on December 27, 1984, it was discovered, peeping out from beneath the snow, in a desolate region know as the Far Western Ice field, adjacent to a ridge of rocks named Allan Hills. Bobbie Score made the discovery. It drew her attention because it looked green. A portion of the outer black shell had broken off, and the inside looked green. Score labeled it: ALH 84001. “84” for the year, and ALH for Alan Hills. and 001 because she believed it was so unusual it deserved to be among the first to be analyzed. It was placed in a sterilized clean bag. It weighed 4.25 pounds. Her field notes described the meteor as “highly shocked, grayish green. “She identified it as an achondrite, a rare type of meteor which is associated with planets and not asteroids. It was packed into an ice chest, and sent to NASA’s Johnson Space Center where it was placed in a nitrogen chamber and freeze dried to remove any snow or ice or water. It was photographed, a chip broken off and examined, and then classified. However, in the lab, it no longer looked green, but more like a piece of broken cement.Then it was sealed in a sanitized bag, and filed away along with other meteors, on the 2nd floor of the space center, and forgotten. Almost 6 years would pass before it true identity and the secrets its held, would begin to be discovered. The first indication this meteor was unusual was in 1990, when Duck Mittlefehldt analyzed a small chip with an electron microprobe. The signature of the x-rays ricochet off the meteor indicated it was similar other meteors known as SNCs. SNC is an acronym for three meteors believed to have originated on Mars: the Sherotty, Nakhla and Chassigny. ALH would become the 10th SNC. Donald Bogard and his colleagues, examined the meteor to help determine its origin. They studied the chemical composition of gasses inside black beads of glass-like material that had bubbled up when the rock was ejected by a violent shock. The gasses matched the Martian atmosphere perfectly as measured by the Viking space craft which sampled the atmosphere in 1976. By measuring the effects of high energy cosmic rays which impacted the rock while it was in space they deduced it must have orbited in space for 16 million years. Further, by analyzing radioactive decay they estimated it must have sat in the Antarctic ice for 13 million years. Various dates have been given for the rock, based on an analysis of radioactive decay. Moreover, ALH 84001 displayed magnetic properties, ALH 84001 is a cataclastic orthopyroxenite. It initially crystallized at ~4.5 Ga and was involved in a major impact event at 4.0 Gyr that reset the Ar/Ar clock. It was expelled from the Martian surface by another meteor strike at approximately 15 Ma and eventually landed in Antarctica some 13,000 years ago. Apparently it was created between 4.5 to 3,8 billion years ago during a time when Mars still had a magnetic field. Given its age, it is estimated that it must have originated in the heavily cratered southern half of Mars, possibly linked to the Sinus Sabaeus region that has a large impact scar formed around 4 billion years ago. Mittlefehldt soon discovered the martian rock contained high concentrations of carbon compounds. He also observed rounded carbonate globs and spheroids inside the fractured surface which were visible to the naked eye. It was determined that these globules and elongated spheroids had been recycled through water, and were likely biologically produced. Carbonates are typically produced by creatures who live in the ocean, and are found in fossil beds of dead sea life. The orange carbonate globules had to have formed on Mars as the pattern of cracks would not have occurred upon striking the Earth. 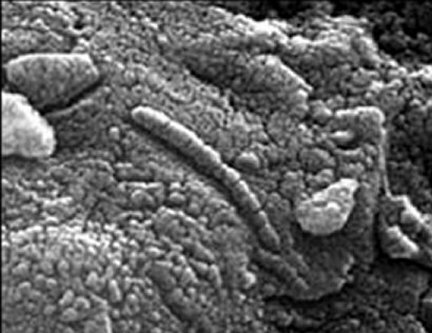 The globs also had the same isotopes as the Martian atmosphere, whereas the oxygen isotopes indicated they had formed in water.Thus, the Martian carbonate minerals and carbonate globules were most likely formed by Martian microbes when Martian water seeped into the cracks when this rock was still part of Mars. The carbonate residues were formed in water, and where there is water, there is life. The Martian carbonate globules, were also discovered to contain calcium rich cores coupled with dissolved carbonates and magnetite and iron-sulfides -which were likely produced via biological processes (McKay et al. 1996); i.e. 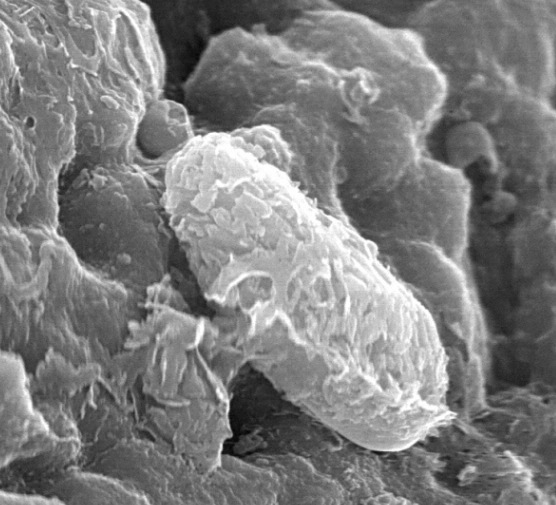 carbonate and iron-eating bacteria. The outer rims were also oxidized in a pattern that indicated biological activity; that is rusting and reducing. Everett Gibson and Christ Romanek, alerted by Mittlefehldt, studied the rock and found the carbonates had formed within temperatures habitable to life. Thus the carbonates had formed in water when temperature on Mars could support life. Borrowing a technique from Robert Folk who had discovered nano-bacteria on Earth (which range in size from 50 to 100 nanometers) Romanek used acid to etch away some of the rocky material and immediately spied forms which looked like nano-fossils. The nanofossils looked basically identical to those discovered by Falk. Kathie Thomas-Keprta began examining the rock and found magnetic crystals. These crystals are typically created by water-living bacteria who use them for navigation. These crystals act like magnetic compasses; the magnetic properties coming from the magnetized iron. The magnetic crystals in the martian rock looked just like those created by water living bacteria. 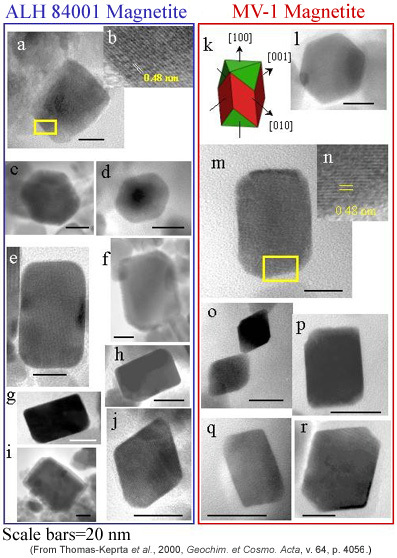 Moreover, the magnetite particles were determined to be similar chemically, morphologically, and structurally to magneto-fossils (McKay et al. 1996); i.e. the fossil remains of bacterial magnetosomes, including those found in fresh pond water. These crystals were well-organized, elongated and free of defects–which on Earth are considered as indisputable evidence of biological activity. Crystals which are non-biological have chaotic defects and are filled with impurities. This was not the case for those inside the Martian meteorite. Microbes wall of a space inside their cell where they engage in the synthesis and creation of these crystals. Thus these crystals are small enough to fit inside the cell, but large enough to hold a charge. Microbes also align their crystals into chains, so that the entire chain acts like a huge magnet. This is exactly how those in the Martian meteor were organized. 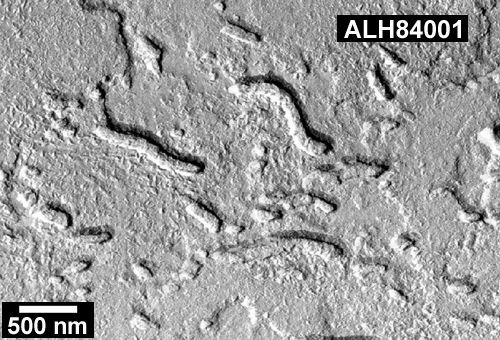 Using an electronic microscope, E. Imre Friedmann, FSU, in PNAS 2001, examined the Martian rock and round the telltale “choo choo train” formations characteristic of those produced by Earthly bacteria. They were lined up like a string of pearls–like vertebra running up the back, and all were similar in size and shape and did not touch each other, meaning they were flexible and allowed the organism to move. Their purpose could only be to enable their owners to navigate by reacting to a Martian magnetic field. Mars had a very powerful magnetic field for the first 800 million years after the planet began to form. 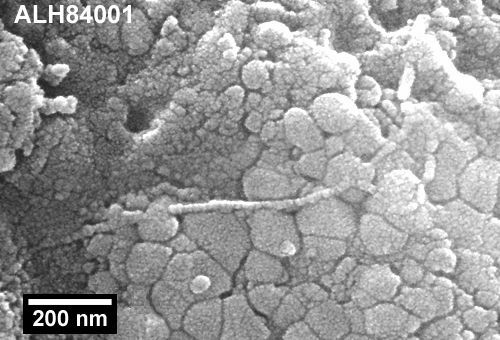 (Left) Small grains of magnetite (iron oxide) and two types of iron sulfide encase a Martian bacteria discovered in the Martian meteorite ALH 84001. These are of the same shape and size as the magnetite and iron sulfide grains formed by Earthly bacteria which live inside these grains (Right). The meteor, however, also contained numerous other signs of past Martian life. Simon Clemmet at the Zare labs used a laser mass spectrometer to probe the martian rock. The laser beam, was directed at specific molecular targets which were heated to it about 100 million degrees for one 10th of a millionths of a second. Then the target was struck with a ultraviolet laser beam. By measuring the speed of flight and changes of positively charged molecules striking a negatively charged plate, the mass and identity of these molecules was determined. The result was the positive discovery of Organic molecules called polycyclic aromatic hydrocarbons (PAHs) (with a carbon-hydrogen bond). PAHs are formed by biological processes and are the byproduct of cellular decay. PAHs are formed when bacteria die and begin to decompose. These PAHs, however, were not form Earth, but from Mars. On Earth, PAHs are typically found in fossil molecules, and are derived from biological activity associated with plankton and early plant life. Although PAHs can be formed at very high temperatures from burnt tobacco or petroleum exhaust, these are also biological substances. However, the Martian PAHs were different than those found in Earth’s atmosphere and are unlike 99% of all PAHs found on this planet . They were also discovered inside but not on or near the outside of the meteor, which rules out contamination. Moreover,r the PAHS were found adjacent to the carbonate globules which were also biological in origin. Moreover, the PAHs were found in association with the the outer rims of the carbonate globules were oxidized in a pattern that indicated biological activity. In fact, the highest concentration of PAHs were found in association with those portions of the meteorite rich in carbonates, and were determined to be indigenous. No evidence of laboratory or Earthly contamination was detected (McKay et al. 1996). Thus, it could be assumed that the Martian PAHs may have also been produced by microbes, bacteria, or even plankton and plants; which is not inconceivable as the red planet was awash with Martian oceans and great seas t the time the PAHs were formed. If due to contamination the PAHs should be most abundant on the surface of the meteor but it was not. 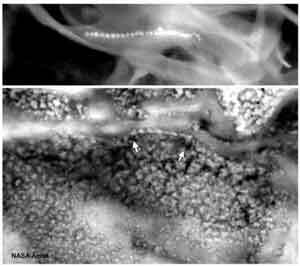 There was little on the surface and increased in concentration as they penetrated into the interior, and the most was fund next to the carbonate globules, where it was concentrated, and in the same areas where the magnetic crystals were also the most abundant. 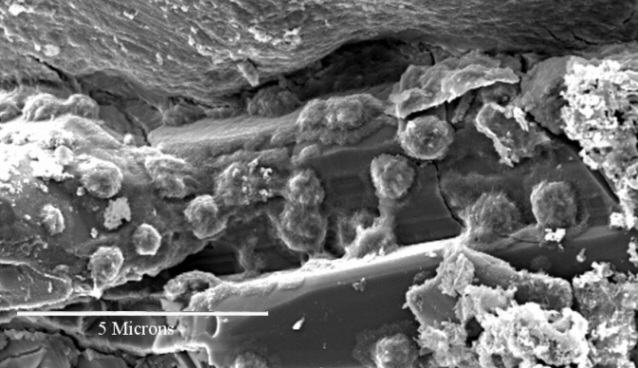 In response to concerns about Earthly contamination, Richard Zare responded: “On the contamination issue we studied micrometeorites from the same meltwater in Antarctica and found a different pattern than we did in the Martian meteorite, and I don’t see how contamination could look so different in two meteorites from the same area.” Likewise, Simon Clement (1998) has independently reported that he found no evidence of terrestrial contamination and concluded that the PAHs are extra-terrestrial in origin. The PAHs were produced by Martians. When these creatures died they left PAHs. However, they also left the mineralized fossils of their bodies. In 1996, this team of NASA scientists, headed by Dr. David McKay reported the discovery of fossilized bacteria in this 4 pound 4 billion year old Martian Meteorite. 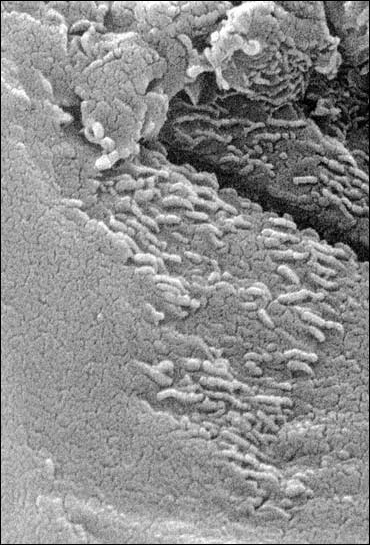 Using technologically advanced high- resolution scanning electron microscopy and laser mass spectrometry NASA scientists discovered clusters of microbes which had all the characteristics of bacteria, including those which were egg-shaped, globular, and tubular, some with the appearance of segmentation suggestive of a head and a tail. These Martian microbes lived and died in large colonies in a watery environment, and were fossilized alongside and within organic residue typically produced by bacteria. Many were strikingly similar to iron-eating bacteria and microscopic fossils of the tiniest bacteria found on Earth, called nanobacteria. However, and of equal importance, the fossilized bacteria discovered in the Martian meteor are not associated with frigid climates. All the microfossils were in fact found within and not on the surface of the meteor. The only bacteria similar to the Martian bacteria are found in salt deposits and in iron ore deep beneath the Earth. Therefore it is not reasonable to assume the fossils of Martian bacteria are due to contamination as the meteorite was found in Antarctica. 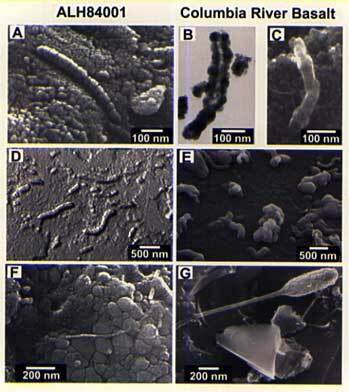 It was also determined that these Martian carbonate ovoid fossils were similar in shape and size to nanobacteria, whereas the elongated forms resemble fossilized filamentous bacteria. Further study, in fact, revealed the presence of long, segmented microfossils (McKay et al. 1996), i.e., microtubules. The magnetite (M) is found in topotactic association with carbonate and was evidently formed by decomposition of siderite. 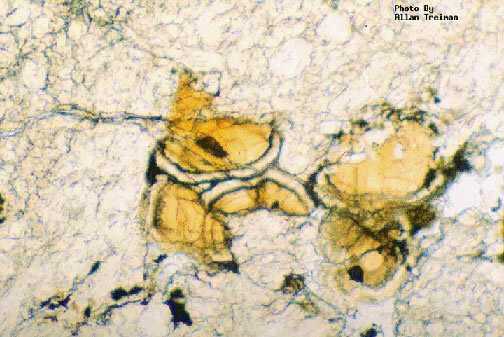 Both M, and Mg-rich carbonate periclase (P) are formed in association with microbial life. As noted, the fossils were found in association with microscopic oxygen and iron mineral grains, called magnetite, and alongside the carbonate globules and iron and sulphur grains, and the PAHS. These minerals are only found together when they are created biologically and are identical to those produced by bacteria. In fact, 25% of the magnetite in ALH 84001 occurs only in association with the biologic activity. They are a byproduct of iron-eating hyperthermophiles who metabolize and convert iron oxide to magnetite. Thus, the evidence is conclusive. These creatures lived and died on Mars, over 4 billion years ago. They lived at the same time life was appearing on Earth, and during an age when both planets were being pounded by asteroids, meteors, and oceans of frozen ice. On October 31, 1996, British scientists and planetary geochemists, Colin Pillinger, Ian Wright, and Monica Grady, announced that they too had discovered evidence that life once existed and thrived on the red planet -Martian life that flourished as recently as 600,000 years ago. Thus there is evidence that Living creatures have populated Mars for much of its history, from 4 billion years until 600,000 years ago. Indeed, there is considerable evidence that life may still be present on Mars. On earth innumerable species live within the permafrost, and even miles beneath frozen ice. Some are active. Yet others are dormant and awaken from their icy slumber when the ice begins to thaw. Unfortunately, the rovers and the Phoenix were not designed to test for the presence of life. Nevertheless, evidence for life on Mars was discovered in 1976, though for reasons that are not at all clear, NASA issued conflicting reports about the findings. Part of the problem was due to the fact that the two Viking space craft were sent NOT to where life may exist, but to those regions of Mars the least likely to contain life. The exploration sites were chosen for safety and not science. In addition, the equipment and experiments conducted by the Viking landers were not designed or calibrated properly, and were not sufficiently sensitive to detect the presence of microbes which might be living in permafrost or frozen tundra. Yet, even with these limitations, biological activity associated with microbial activity including reproduction, was in fact detected. Specifically, the “Labeled Release” (LR) experiment took a sample of Martian soil and added a nutrient that contained radioactive carbon. The purpose was to detect the presence of radioactivity in the gasses released that would indicate biological activity. A control experiment treated a second sample that had been sterilized. In every experiment conducted, positive results were obtained from the unsterilized sample, and negative results were obtained for the sterilized sample. Thus,the LR experiment proved there was life on Mars. A variety of life forms and innumerable microbes could easily flourish on Mars, some living in the permafrost, just inches beneath the soil, others hundreds of feet beneath the surface. The dominant life forms are probably extremophiles, microorganisms which obtain energy from minerals, metals or the reduction of carbon dioxide. Those who digest carbon dioxide or who feast on other organics would in turn release various gasses including methane as a waste product which would accumulate in the atmosphere only to bleed away into space. In fact, gasses released from within the soil are indicative of a huge biomass of Martian microbes. In 2003, huge plumes of methane gas were detected in the Martian atmosphere. On Earth, methane is generally produced biologically, by living and decaying organisms. The Methane was detected by Michael Mumma of the Goddard Space Flight Center who employed infrared spectrometers on three Earth-based telescopes, About 19,000 metric tons of methane were detected in these plumes. Beginning in 2003, Europe’s Mars Express spacecraft tracked three separate methane plumes. Several possible emission sources were identified in the northern and southern hemispheres, in the vicinity of Arabia Terra, Nili Fossae and Syrtis Major. On Earth, 90% of all methane released into the atmosphere is produced biologically. Methane is released as a waste product by bacteria and burping, farting cows. Other Earthly sources include termites, decay in anaerobic paddy fields, peat bogs and landfill. The other 10% is produced geologically, such as via the interactions of water with molten lava belched out by volcanoes. Even so, only minute concentration of methane exist in the Earth’s atmosphere. It is highly unlikely, in fact, it is improbable that the Martian methane plumes were produced by a non-biological sources. On earth, because of geological phenomena such as plate tectonics, and volcanic activity, various gases are continually burped into the atmosphere. On Mars, whatever seeps into the soil, rock, or which comes to be locked beneath the surface of the planet, remains locked in place. However, microorganisms would actively secrete and excrete methane, which would leak out from the surface and into the atmosphere. Thus microbes are most likely the source for methane which is constantly being replenished. Titan. Widespread cloud cover of frozen methane (lower R). Dark area indicate seas of liquid methane. 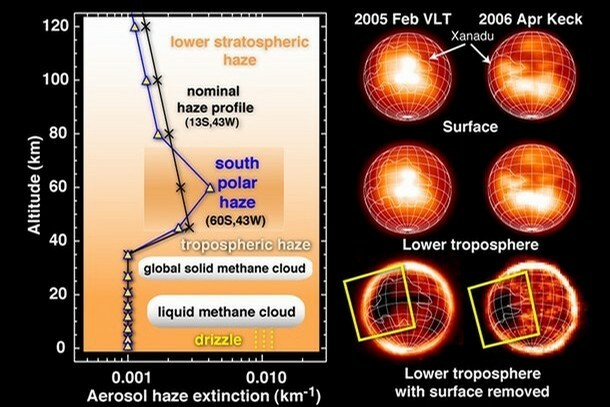 The chart on the left track’s Titan’s methane aerosol haze by altitude, showing the heights of frozen and liquid methane clouds. Liquid methane rains down in the mornings. The bright region named Xanadu, is awash with Methane Images were taken in 2005 and 2006. Saturn’s largest moon, Titan, is also awash with methane. Rivers of liquid methane flow across the surface and there is widespread clouds of frozen methane, suggesting that it rains methane on Titan. If the source is biological or geological, is unknown. On Mars methane is readily destroyed by chemical reactions or leaks into space due to the solar wind, the lack of a magnetosphere, and the sun’s UV rays. Thus, the fact that methane has been repeatedly detected, even at very low levels, indicates a living source must be continually excreting this gas. Further, because of seasonal changes in the tilt and orbit of Mars, it would be expected that biological activity would be cyclic, and thus the amount of methane released should wax and wane over time. Between 2003 and 2006, the size of the methane plumes decreased in size and extent. Although fluctuations in biological activity is a reasonable explanation, it is possible that temperature changes also associated with alterations it the tilt and orbit of Mars, trigger the opening and closing of cracks in the surface which effects venting from the planet’s interior. Likewise, these same temperature changes could cause various microorganisms to be released from their icy cocoons and to begin digesting and secreting methane upon awakening. However, if the methane is being produced by living organisms, there should be evidence of other complex organic molecules in the atmosphere, and so far these have not been discovered. Mars was once awash with water, lakes, rivers, streams, and oceans; and like the oceans of Earth, much of Martian water must have also come from space. And where there is water there is life. In fact, there is still evidence of water on Mars, including frozen ice at the poles, and what appears to be shallow pools of water on the surface. What became of the oceans of Mars, is still a mystery. Nevertheless, 4 billion years ago and perhaps as recently as a few hundreds of thousands of years ago, Mars may have been lush with life, and evidence of past life and the oceans of Mars, can still be foundon the surface. The evidence is compelling, and includes data and/or microfossils recovered from 4 Martian meteors. These meteors are all presumed to be from Mars and to have originated on Mars based on measurement of gases trapped in one meteorite’s interior. The trapped gases match those measured in the martian atmosphere by the Viking Space Craft in 1976. However, this finding assumes that the Martian atmosphere has not changed in billions of years. Based on overwhelming evidence, it can be concluded that living creatures dwelled on Mars beginning 4 billion years ago, at about the same time life appeared on Earth. Some of these Martian microbes lived in a watery environment. Others dwelled within rocks deep beneath the soil and bathed in water which seeped down into cracks within the rocks. Those microbes which died were fossilized when the water mixed with organic residue, creating carbonate cocoons which imprisoned their remains. However, when pieces of Mars were sheared from the surface and flung into space, this debris probably carried not just fossilized remains, but huge colonies of creatures that had not yet died–some of which fell to Earth. However, this does not mean that life on Earth came from Mars, or life on Mars is from the Earth. In two scholarly, scientific monographs available on the Cosmology.net website, overwhelming evidence is presented detailing the origins and evolution of life including the origin of this solar system. Life on Mars and Life on Earth, like our solar system, ultimately have the same source: a titanic parent star and its planets which were destroyed in a supernova nearly 5 billion years ago. The ancestry of Earthly and Martian Life can be traced to creatures that arrived from space, encased in all types of debris which in turn had come from other, more ancient worlds. Life on Mars, came from other planets. Now if life-laden meteorites and comets crash landed in the primitive oceans, they could have subplanted the early natives. Here I’m completely agree with you that the space life was not original life on earth, but I suspect the origin of life were deep ocean vents. It may be a possibility. Scientist suggests panspermia, but it is wrong. I don’t think any seed of life could survive from such impacts. most interesting question comes here..
From where life originated first?